I had the pleasure of presenting "Web Components Now: Dart and Web UI" at JFokus 2013. In this presentation, I covered the new hotness coming to the web platform and how Dart helps to bring much of to modern browsers today. Encapsulation, templates, custom elements, and dynamic data-driven views are made available thanks to Dart's Web UI library (heavily inspired by Web Components and Model-Driven Views). The slides are now available. WARNING: You might need Chrome Canary to see all the demos in action. If you're interested in these topics, you can learn more about Dart and Web UI. JFokus was a blast. Great conference, friendly crowd, excellent A/V setup! As an old Java developer, it felt good showing off the hotness of modern web development and structured web languages to a "hometown" crowd. Check out this Photosphere pick of the conference room, thanks to Alexis Alexis Moussine-Pouchkine. Thanks to everyone who came to the presentation! 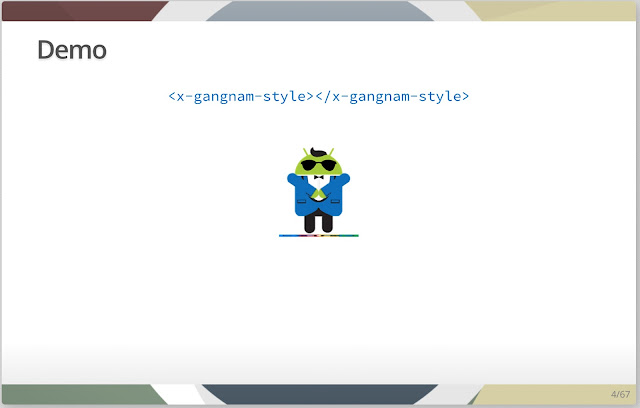 Big props to Mr. Eric Bidelman for some of the slides, and the awesome <x-gangam-style> tag.